Charlie Silvercloud III has a problem. His father and grandfather were both killed by milk trucks on their 25th birthdays and Charlie is about to turn 25. He has accepted his fate and is going about shopping for caskets and returning his library books when he meets a girl who won’t let him die in peace. Teeth is a short “last laugh” tale of two old friends, their teeth and a series of events that leaves them lost for words. Seven year-old Sammy is convinced that he has been bitten by a poisonous snake. He spends the afternoon diagnosing what he believes to be the first signs of his impending death. Can his father come to his rescue? Everett decides to reveal every terrible habit, attitude and hang up on the first date. Shockingly, women don’t respond as he’d hoped... until he meets Brinn, who’s willing to play his game and try for FULL DISCLOSURE. 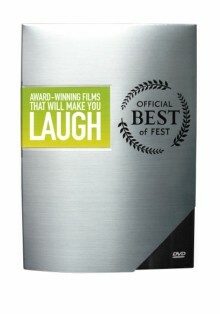 Winner, Best Short Film: Seattle International Film Festival, Stony Brook Film Festival, Sedona International Film Festival, and numerous others. For as long as he can remember Leslie has wanted to be one of the hard guys. Today he starts a new school and this time he might just make it. If only he can resist the lure of joining - THE CHOIR. A mild-mannered man‘s world is invaded by a ferocious, territorial bird, thrusting him into an action-filled battle that transforms his life into something far beyond his dreams. An enthusiastic dentist, a reluctant patient, and a strange picture on the wall. A touching comedic tale about an Irish Pigeon Racer, Seamus Kerrigan, who gets embroiled in an International drug trafficking plot to smuggle drugs over to Ireland from Holland using carrier pigeons. Colin takes his dog Cumberland to the park for a game of fetch but Cumberland has other ideas. What happens when man’s best friend refuses to cooperate? A new strain of a disease that could be dangerous to livestock herds is being discussed on the radio. A cow listening to the show naturally gets a bit worried about the topic. A man in a suit dreams of being a horse. Sometimes, when you’re in the autumn of your days, you’ll try anything just to put a smile on your face again. And so in this tale we meet two pensioners who manage to reignite the love they’d almost forgotten about. Unfortunately, soon the law comes knocking at their door. An innocent local boy confesses to a priest who is more interested in gossiping about the local women‘s nightlife than in absolving the boys sins. But all is not as it seems. A tragic comedy that looks at the surf culture and the ways in which peer pressure can lead us from our true identity.